This image is very large. Please wait while the map loads. Click to download a high-resolution version. Kreis Fürstenthum, technically Kreis Fürstenthum Cammin, was a Prussian district in Hinterpommern until 1872. Its Kreisstadt was the city of Köslin. 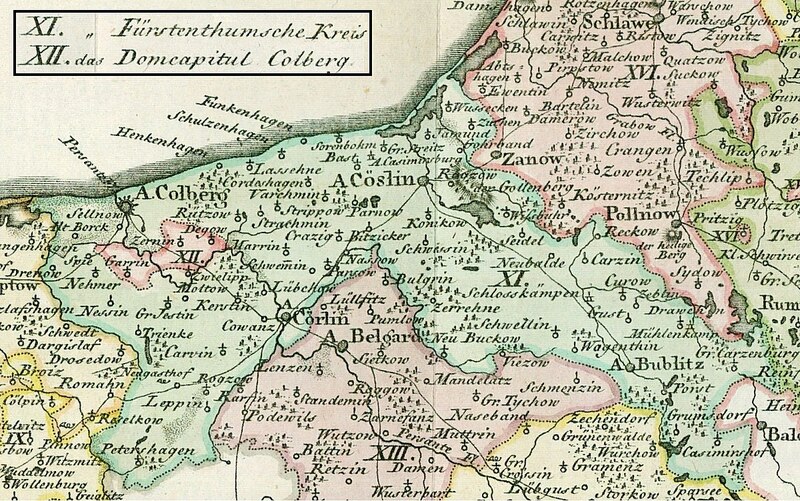 After Pomerania, including the Principality of Cammin, had fallen to Brandenburg-Prussia in the 17th century, Fürstenthum Cammin continued as a Prussian district. 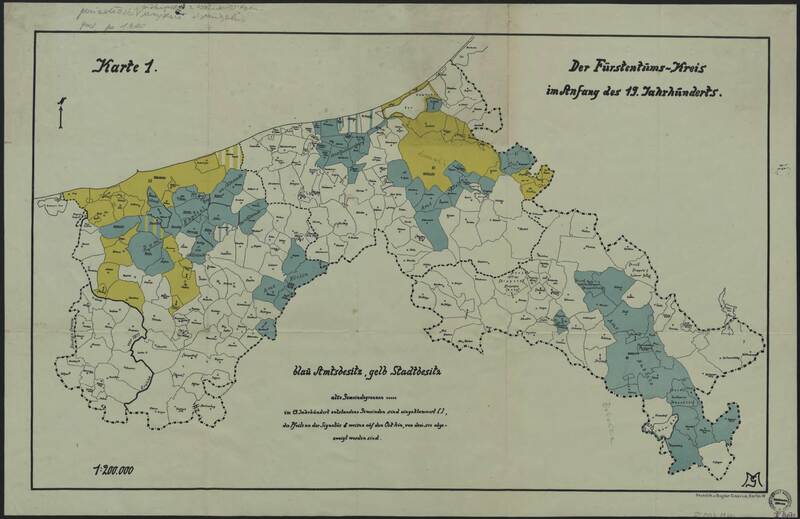 The district consisted of the cities Bublitz, Kolberg, Körlin and Köslin, the royal offices of Bublitz, Kasimirsburg, Kolberg, Körlin, and Köslin, as well as a larger number of noble villages and estates. The eleven villages of the Domkapitels Kolberg were integrated into the Kreis in 1811 after this territory had been secularized. In consequence of the provincial authority regulation of April 30, 1815, it became part of the government district Köslin in the province of Pomerania. In the Pomeranian Kreis Reform of 1818, the Kreis Fürstenthum grew by 29 villages from Kreis Greifenberg as well as three villages from the eastern Kreise. Fürstenthum, unusually large for the time, was divided into the three Kreise: Bublitz, Kolberg-Körlin, and Köslin on September 1, 1872. Despite the proximity, Belgard was never a part of Kreis Fürstenthum. For more information, please see the individual Kreis pages for Bublitz, Kolberg-Körlin, and Köslin.